Air Sénégal, Sénégal’s national carrier has signed a firm order for two A330neo aircraft, the new re-engined version of the best-selling A330 wide-body airliner. The order follows on from the Memorandum of Understanding signed in November at the Dubai Airshow. 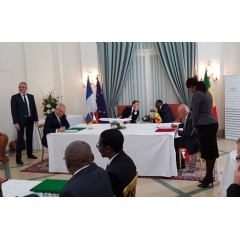 The agreement was signed in Dakar by Philippe Bohn, CEO Air Sénégal and Fouad Attar, Head of Commercial Aircraft Airbus Africa Middle East, in the presence of the President of the French Republic, Emmanuel Macron on a state visit to Senegal, and Macky Sall, President of the Republic of Senegal. “These A330neo aircraft will contribute to developing our medium and long-haul network. It is important for us to begin our commercial activities with aircraft that are both reliable and economical, while offering our passengers unrivalled comfort. This order demonstrates our ambitions for this new airline,” declared Philippe Bohn, CEO Air Sénégal. “We are pleased to count Air Senegal as a new customer. These A330neos will enable Air Senegal to benefit from unbeatable economics and to offer its passengers an outstanding level of comfort and travel experience in its market.” said Fouad Attar Head of Commercial Aircraft Airbus Africa Middle East. Launched in July 2014, the A330neo is the very latest generation in Airbus’ wide-body family. It builds on the proven economics, versatility and reliability of the A330 family, while reducing fuel consumption by about 25 percent per seat. The A330neo is powered by Rolls-Royce’s latest-generation Trent 7000 engines and features a new larger span wing with sharklet wingtip devices. The cabin also provides the comfort of the new “Airspace” amenities.